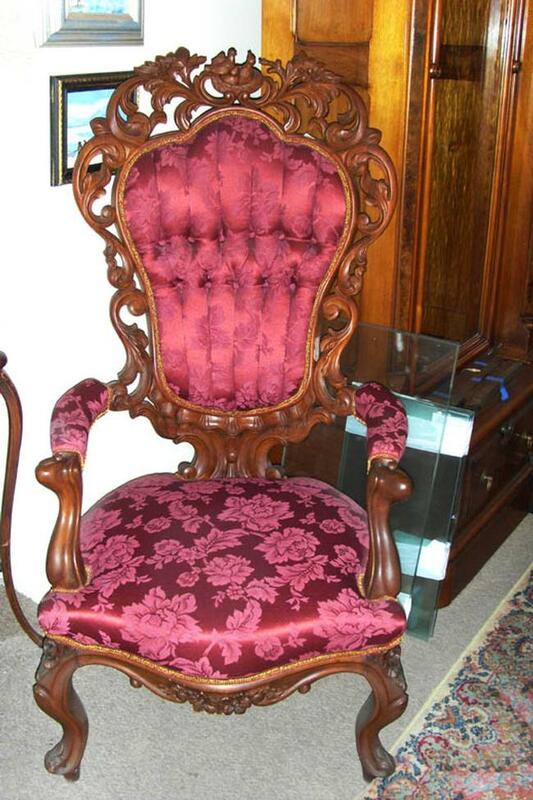 Carved Victorian Chair -- This American Victorian carved walnut chair is just beautiful. Its got flowers on top, centered with a bird's nest with two parents and a baby bird inside. It measures 51 inches tall, 24 1/2 inches wide, and 22 1/2 inches deep. It is newly upholstered and in perfect condition. This American Victorian carved walnut chair is just beautiful. Its got flowers on top, centered with a bird's nest with two parents and a baby bird inside. It measures 51 inches tall, 24 1/2 inches wide, and 22 1/2 inches deep. It is newly upholstered and in perfect condition.